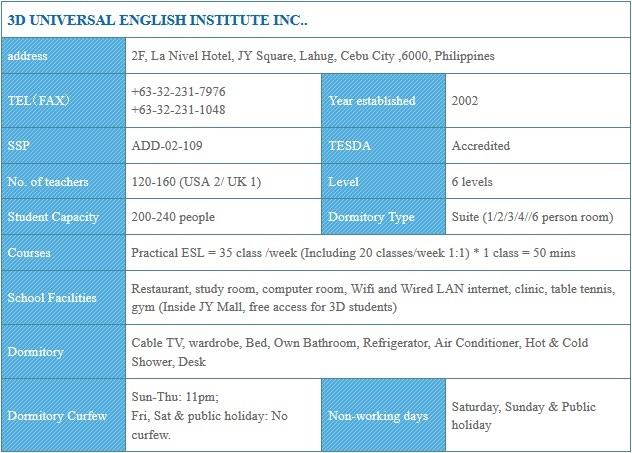 3D UNIVERSAL ENGLISH INSTITUTE INC. is a language school based in the Central Business District (CBD) area of Cebu City, Philippines. We specialize in the practical English as a Second Language (ESL) training courses, TOEIC, IELTS, TOEFL and Business English courses. We provide a full range of programs to train the students’ communication skills using English. We have courses specifically designed for students from Beginners to Advance English level. Our students come from all over the world, including Japan, Korea, Taiwan, Mainland China, Russia, Middle East countries, Jordan, Germany, France, and Spain. We provide full accommodation and meals during the students’ stay with the school. 3D UNIVERSAL ENGLISH INSTITUTE INC. was established in April 2002. It was the second language school that had gotten the accreditation from the Philippine government. Since 2002, we had nurtured over 7,000 international students. During the 10 years anniversary (2012), the name of the school,“ MTM JY” was changed to“3D UNIVERSAL ENGLISH INSTITUTE INC.” to reflect the more progressive and multifaceted branding strategy of the school in the next decade. The practical approach for our English as a second language (ESL) program constantly separates us from other schools. We continuously encourage students to “Learn English through daily conversations”. We are fully committed to the students’ growth and diversified learning path through various industrial collaborations. We aim to be globally competitive and strive to be the best ESL center for students from different parts of the world. ❛❛Towards the Global 3D ACADEMY❜❜ Our vision is to develop 3D ESL into a global brand. The leader of 3D is a young entrepreneur, with business across Japan, Singapore, and the Philippines. Despite being a successful businessman, he still relentlessly devotes his time to studying. He is currently enrolled in the EMBA program of the University of Chicago Booth, one of the top MBA institutes in the world. Under his leadership, 3D aims to strive towards excellence and to spread our network to every part of the world. ❛❛We are all about your future! !❜❜ In 3D, we believe that English is the most important tool to expand students’ horizons and to cultivate their international perspectives. We believe that a good command of English will offer students endless opportunities as the globalization trend continues. Hence, we are devoted to lay down the most solid foundation in your English learning journey towards a better future! ❛❛Nothing works better than practice❜❜ The most difficult part of learning English (Or any other language) is that it is not a subject or discipline where you could basically sail through with hard work and memorization. It is all about PRACTICE! To speak English fluently, you have to be able to express your thinking naturally with this language, as if you are speaking your mother tongue. In 3D, we believe that the most effective way of learning English is by immersing yourself in a total English environment. We have developed a range of methods by integrating the daily entertainment and syllabus into your 1:1 class to help to harness your English communication skills. We provide an optional two hours classes in addition to the seven hours of regular class time. “Casual Discussion” is a class that allows students from all walks of life to gather casually in our ‘English ONLY Zone’ and discuss some reality and in-depth issues. “Review Class” is a self-study class with the support of a skilled teacher by providing input for the student’s vocabulary, grammar and reading skills. Students have the options to attend any of these two depending on the teachers’ availability and their own timetable. Attention! Native Speakers in the house! As good as we hand-selected every teacher with the highest teaching quality in town we could find, we also provide you an option to have group class with our native teachers from USA and UK who can provide you the American/British accent training.